You don’t need to be from the Chesapeake to appreciate a Maryland-style crab cake. With a hint of Old Bay seasoning – which you can omit or substitute with seasoned salt or a pinch of cayenne for added kick– and fresh crab, you can’t go wrong serving these crab cakes for dinner. 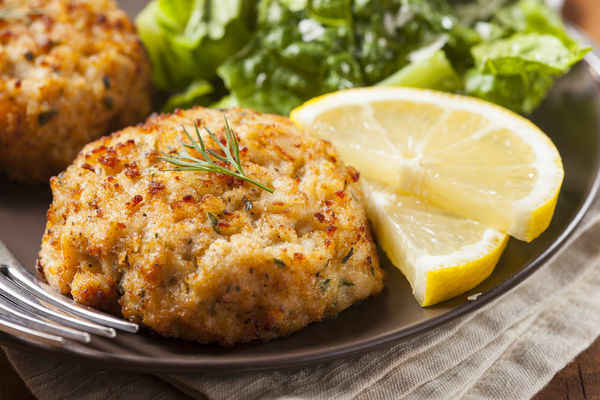 If you’re a crab cake aficionado, then you know everyone has a preference, things like breadcrumbs vs. crackers in the filling, or sautéeing vs. baking vs. frying when you’re cooking. We wouldn’t turn down a crab cake made any of those ways, but this recipe gives instructions on the skillet and in the oven, depending on what you’d like. To keep the crab cakes from falling apart while you’re cooking them, you’ll want to refrigerate them for a bit before cooking. Keep that prep time in mind when making these crab cakes, and you’ll be good to go. Decide whether youíd like to sautÈ or bake the crab cakes. If you want to bake them, preheat the oven for 400 degrees F.
If necessary, drain the crabmeat and pick through it for shells (shells wonít be in jumbo lump crabmeat). Put the crab in a medium-size bowl and set aside. Get a small bowl and whisk the egg, mayonnaise, mustard, Old Bay seasoning (or substitute), lemon juice, Worcestershire sauce, and salt. Pour the mixture on top of the crab and gently mix until well-combined ñ be careful to gently break up lumps with your fingers and not to over-mix. Add the breadcrumbs and parsley to the mixture, and gently mix them until well combined. You want the mixture to still have a loose, meaty texture– not mashed together too much. Cover the crab cakes with plastic wrap and let them refrigerate for one to three hours. Mold the crab mixture into eight crab cakes ñ each should be about an inch thick. If you want to sautÈ the crab cakes, heat the butter and olive oil in a 12-inch nonstick skillet over medium heat. Once the butter is frothy, add the cakes to the pan and cook on one side for four minutes, about when the underside will be golden-brown. Then, flip the crab cakes and reduce the heat to medium low. Cook the cakes for another four minutes, or until the other side is golden-brown. If you want to bake the crab cakes, then melt extra butter and brush a baking sheet with it. Put the crab cakes on the sheet. Then, melt the 2 tablespoons of butter and the olive oil together, and brush the tops of the crab cakes with it. Bake them for 20 minutes. Serve with lemon wedges and your choice of side dishes.